Opened as The Danmoore Hotel in 1906, this building at SW 14th and Washington has known a number of different names over the years, including Nortonia Hotel, Ramapo Hotel, and now Taft Home, a residential care community. In a few years, Cotillion Hall (now Crystal Ballroom) would replace the building at far left. In the late ’70’s I worked in the kitchen at what is now Cassidy’s Restaurant on the Washington side of the building. Back then it was a bar called Pretty Boy Floyd’s and had a 30’s decor. I helped the owner salvage wood moldings and doors out of some of the buildings being demolished in downtown around that time, and we used them when he expanded into the storefront next to the bar. Great picture! Amazing how little the building has changed since then. The early auto parked behind the horse drawn wagon is a harbinger of the advances in technology that would change Portland so thoroughly since that day. I liked the look of the awnings on the upper floor windows, though the invention of the air conditioner also made them obsolete. OK, a little research shows both a Taft Home, The Taft House and a Taft Hotel at 1337 SW Washington, which I presume is this bldg. Nothing however, says it was ever the Nortonia. Currently I am showing a lot of listings as a drug-rehab facility and a lot of other medical type ads. And an article saying they were closing the Taft Home down in 2002 unless someone stepped up to the plate. Unknown if that ever happened but judging from the Google Earth photo it still houses low-income and possibly mental patients and disabled which it did before. Hmm. Ebay has some Ramapo Hotel letterhead paper for sale. Give a date of 1912, so apparently it was called that, then. Also, here is a site that has some “raid” photos of a gambling place called the Ramapo in 1940’s or so but can’t tell if it is this place or not. Roxanne, when I worked there in the 70’s, it was the Taft hotel upstairs. Most residents seemed to be elderly, low income and some even “eccentric”. It was common to come in to work and find water leaking through the ceiling because one of the residents had plugged the toilet. I remember one old guy in particular that would come in for a beer and end up yelling at us for no apparent reason….Ahh good times! My parents had a blue wool blanket with “Danmoore Hotel” printed on it. I believe my mom said they honeymooned there back in the ’40’s. Parents have passed on, but the blanket is still in pretty good shape. I remember staying at the Danmoore with my family a time or two c1950 so the place must have been reasonably respectable then. The Mark Spencer was originally named the Nortonia according to various historical items they have on display in the lobby. I worked there in the early ’70 when Bob Kohler owned it. I spent almost a year ripping out layer upon layer of carpet and wallpaper and re-painting everything. Dirty job but I was lucky to have it. Bob is (I hope you are still around, Bob) a good man and I am glad I got to work for him. Remember the old elevator? In the middle 60’s my Mom and I lived there. Rented month to month or week to week. I don’t remember. I do fondly remember the old elevator. I’ve never seen or been in another one like it! I have many favorite memories from there. We had just moved here from Idaho and didn’t know very much about Portland. I sure grew to love it! So how does the Danmoore on Morrison, south of First Pres fit in? When was that built? I’m missing something here. Have a large photo of my father-in-law and wife (circa early-1940’s, when my wife was an infant), clearly in front of the old Danmoore. Has it now been demolished? The building in the image was subsequently renamed that Taft Hotel after a new Danmoore Hotel was build down the street. The Taft is still there, but the “new” Danmoore was demolished to make a park-covered parking garage for the First Presbyterian Church. Does anyone have an image of the “new” , now demolished, building? The signage on the photo I have, appears to differ from that in the picture heading this article. Thanks! Michael, a person going by the handle Thriftstore Cowboy posted a number of photos of the Danmoore during demolition on Flick’r. They need to bring back the awnings. Looks better with them! Still hoping to see an image of the “new”, now demolished Danmoore. 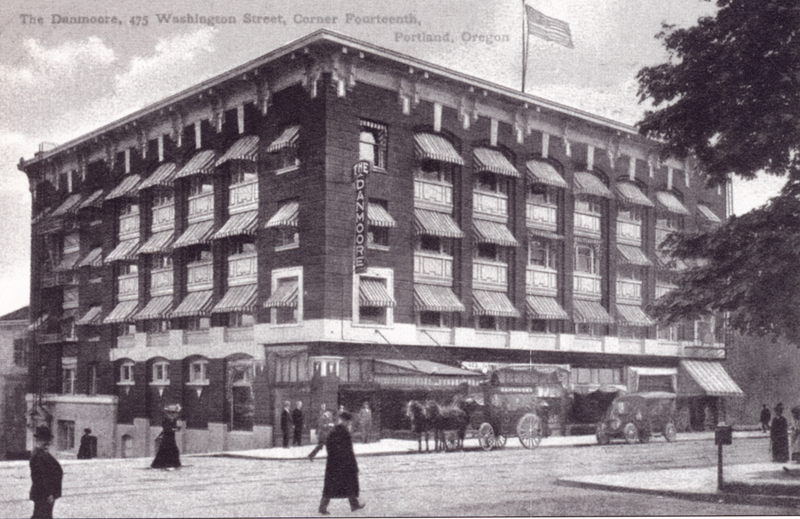 did you know there was a danmoore hotel on sw 12th street next to first presbyterian church it was torn down in early 2000 sad its gone now another boneheaded move in portland ! !